Posted by Eddie & filed under Mountains & hills, Science, July 17 2008. Last weekend I went for a walk on the Cairn Gorm – Ben Macdui plateau, primarily to locate an air wreck site near the summit of Ben Macdui (see the previous blog posting ‘The highest air wreck site in the whole British Isles?‘) but also to see how large the summer snowfields on the plateau were, and how they compared to previous years. 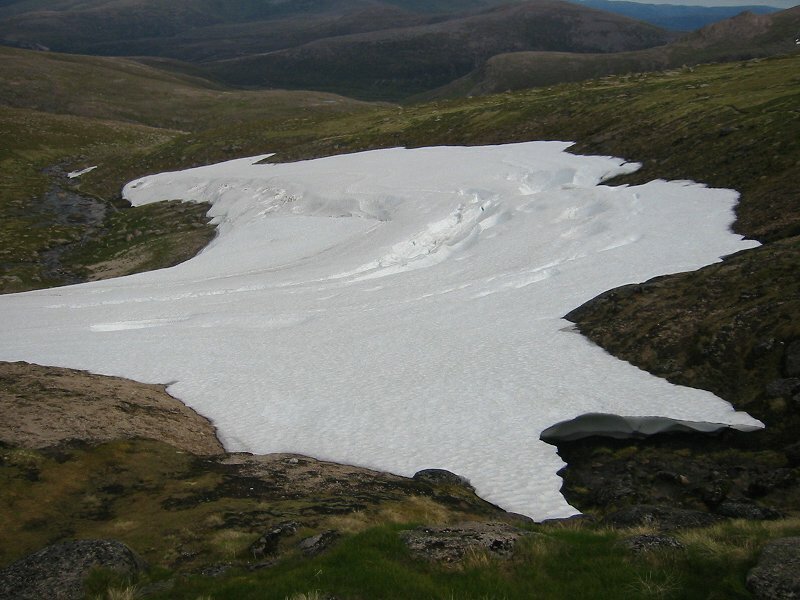 I’ve written about ‘perennial’ snowfields in the Scottish mountains before, see the blog postings ‘Ciste Mhearaidh and even more about climate change and walking in the mountains (zzzzz…)’, ‘Scottish glaciers’ and ‘Has climate change already affected hillwalking in Scotland and further afield?’. 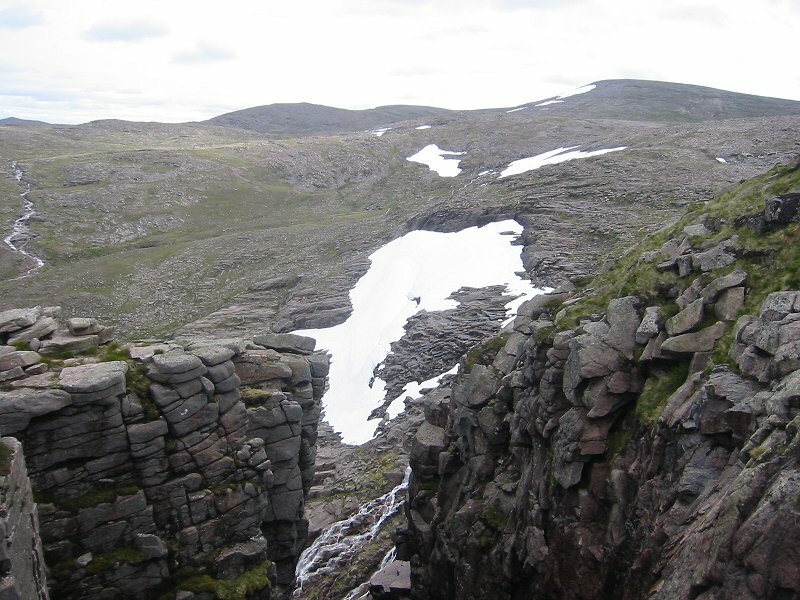 I started the walk by using the ‘Goat Track’ that goes up the headwall of Coire an t-Sneachda, an unusual route in the Cairngorms in that it requires some easy scrambling (most hiking routes are very easy along moderate slopes). The top of this track often contains a snow cornice until the summer months but there was no snow here on this day in July. Many snowfields were visible on the plateau, all significantly larger than when I was here last in June 2006, even though I was several weeks later in the year on this walk. The Coire Domhain snowfield was larger as you can see from this photo taken on 25th June 2006, and this one taken on this walk, on 13th July. 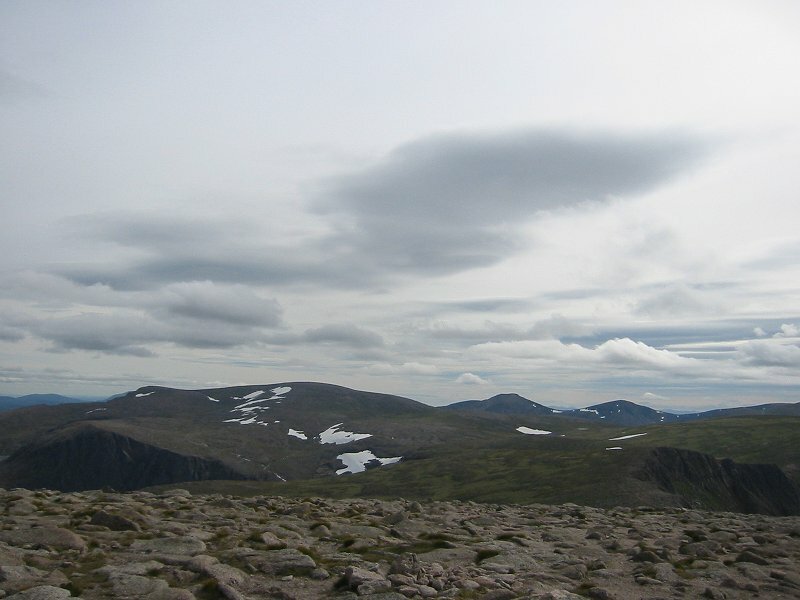 From the summit of Ben Macdui, there were some snowfields visible in the east-facing corries of the Braeriach – Cairn Toul plateau, particularly Garbh Choire Mor, and you can see that they are larger in extent (although not by a huge amount) between a photo taken from the Ben Macdui summit in June 2006 here and from the same spot in July 2008 here. I saw a snowfield on the south bank of the Fèith Buidhe stream where it falls steeply down into Loch Avon from the plateau. 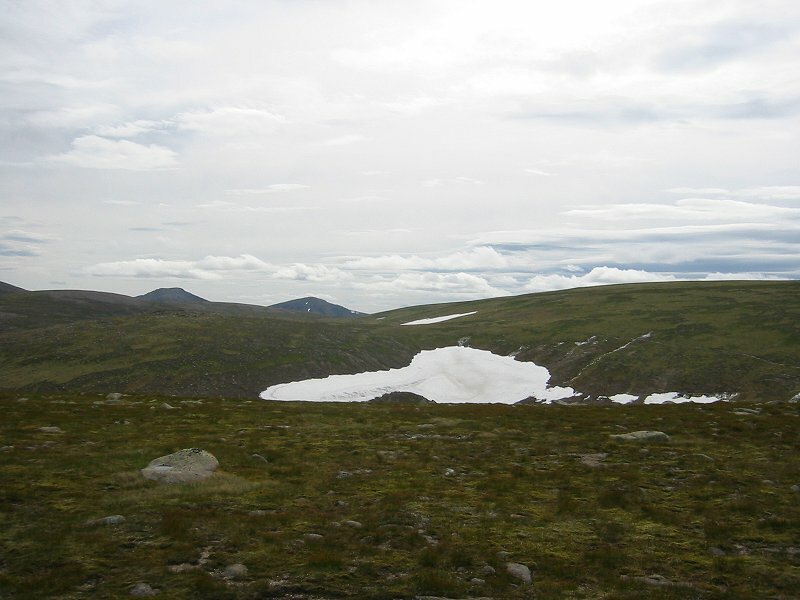 This seems to be the same snowfield that I mentioned in connection with a YouTube video clip in my previous blog posting ‘Glaciers discovered (possibly) in unexpected places – the Cairngorms and… Mars‘. A photo I took of this snowfield on this walk can be seen here. The snowfield appears to be larger than in the video clip, although the video clip is unfortunately not dated (it merely says ‘early 1990′s’). The view of Ben Macdui from the summit of Cairn Gorm across the plateau which I took a photo of in June 2006 here, and again in July 2008 here, shows the increase in the snowfield coverage between the two instances. The Ciste Mhearad snowfield was larger than when I visited it previously in 2007 (on almost exactly the same day of the year, 14th July). You can see a photo of this snowfield taken during this most recent trip here. This seems to indicate that the last 2 years have seen an increase in the size and longevity of perennial snowfields in the Scottish Mountains. I’ve recently discovered the research on Scottish mountain snow patch longevity published in the scholarly journal Weather, by (among others) Dr. Adam Watson, which seems to bear this out (and which is a mine of information on this topic, with data going back to 1971). 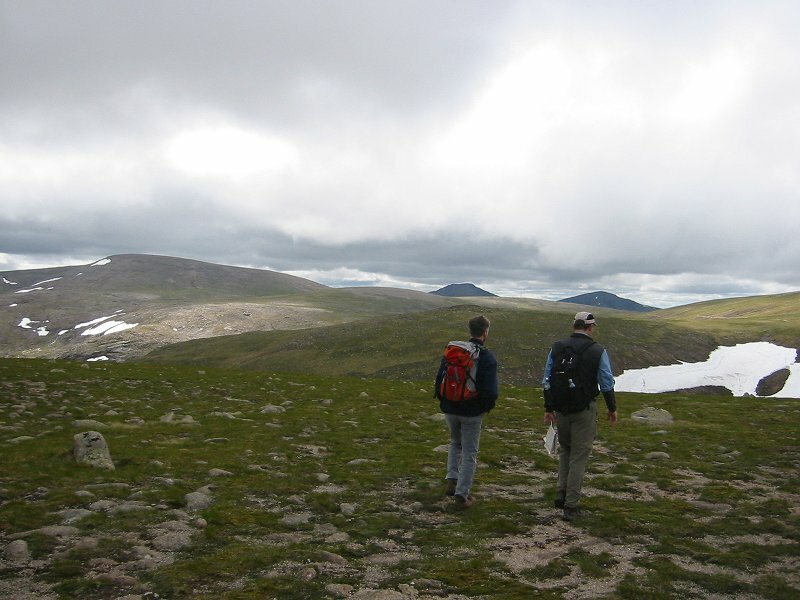 After the period from 2003 to 2006 when there were almost no perennial snowfields in the Scottish mountains, the last two seasons have seen an increase in their number and longevity through the summer months. Here’s hoping this trend continues! You can see all the photos from the walk on my website here.